Barter Books : Austen, Jane : Northanger Abbey and Persuasion. Four volume set. Murray edition. 190 x 140 mm (7 x 6 inches) - xxiv, 300pp; 331pp; 280pp; 308pp. Half-leather cover marbled paper covered boards. Some splitting to external hinges with bindings remaining tight. Volume I with reinforced inner hinge. Minor rubbing and scuffing to leather spines with two small chips to spine of volume IV. Occasional light foxing within. 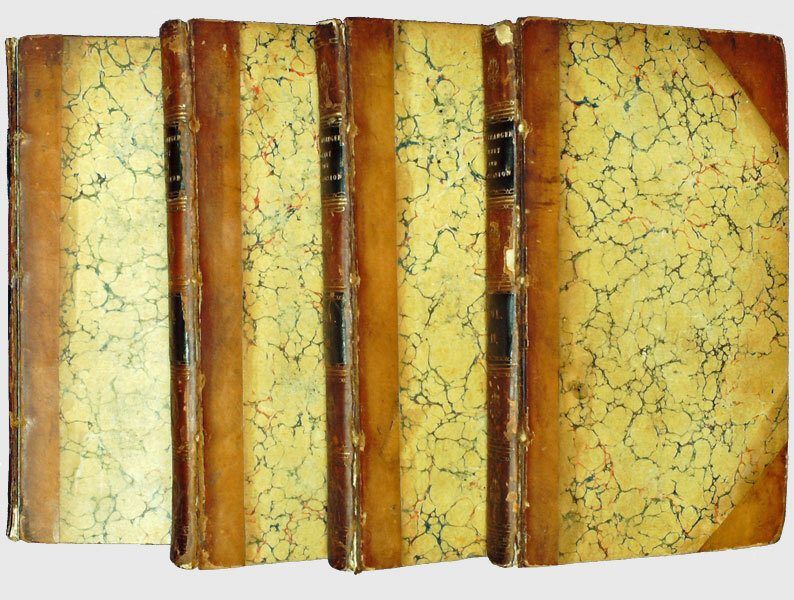 Bound without half-titles but with two terminal leaves to the rear of volume IV. In modern slipcase. In 'Northanger Abbey' Jane Austen composed a classic pastiche of Gothic fiction. 'Northanger' was possibly the earliest of her works and was begun about 1798. It was not published however, until here, with Persuasion, her last completed work in 1818, a year after her death.